USA Patriotism! proudly recognizes . . . patriot Gary Sinise for his tireless efforts and support of the troops. Best known for his Oscar-nominated performance as Lt. Dan in “Forrest Gump,” Gary Sinise is a strong advocate for the troops and has appeared at numerous events around the globe supporting U.S. service men and women. The Chicago native tours with his Lt. Dan Band to perform free shows full of their unique style of oldies and rock and roll. He has also traveled to both Walter Reed Army Medical Center in Washington, D.C., and the National Navy Medical Center in Bethesda, Md., to visit troops wounded in Operation Iraqi Freedom. 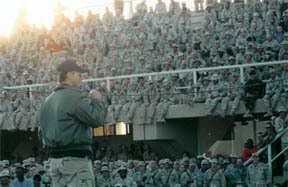 Following a USO tour to Iraq, during which he visited with Iraqi school children, Gary Sinise co-founded Operation International Children (OIC), which provided school supplies to students in Iraq through the generosity of the American people. "I think we do owe our troops a huge debt of gratitude for the sacrifices they make. This is an all-volunteer service, and they're around the world defending our country or helping others defend themselves." Poem saluting Gary Sinise's patriotic efforts > Patriot First! Gary Sinise is also recognized as a Great American Patriot for his over all patriotic efforts.